These lemon cherry oat clusters are naturally sweetened with dates and paired with dried cherries and lemon juice for a zesty flare. Enjoy the clusters on their own for a snack or use it as a topping for smoothie bowls or non-dairy yogurt. 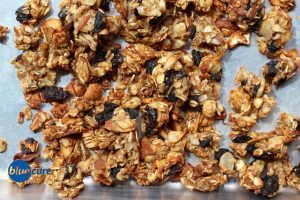 Many granola brands are packed with added sugars (including honey, agave, raw sugar) making them a less healthful breakfast or snack choice. Added sugars lack nutritional value, making them “empty” calories–basically, they provide calories but don’t have nutrients like vitamins, minerals, or fiber. Current recommendations are to consume no more than 6 teaspoons (24 grams) for woman and 9 teaspoons (36 grams) for men. This can add up quickly, especially since sugar is hidden in many packaged foods! Swap in a homemade date syrup (dates blended with water) to naturally sweetened and power-up your oats. Dates are good sources of fiber and potassium. They contain cancer fighting phytonutrients, such as carotenoids, phytosterols, polyphenols, flavonoids, phytoestrogens, and small amounts of anthocyanins. Preheat the oven to 300F. Blend together the lemon, dates, vanilla, ground flaxseed, and ¾ water until smooth. Add another ¼ cup of water if needed for smoothing out the mixture. 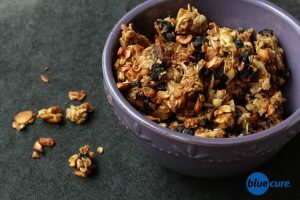 In a bowl, mix together the coconut flakes, dried cherries, cashews, almonds, oats, and lemon-date mixture. Line a pan with parchment paper of a silicon mat. 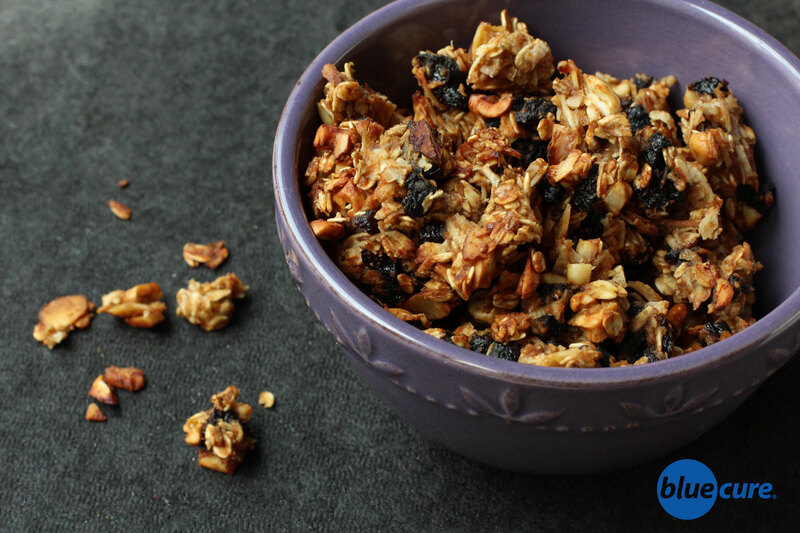 Drop the oats into small clusters onto the pan. Bake for 40-45 minutes, stirring every 10 minutes. Remove the oat clusters from the oven and allow to cool. Serve with plant-based milk and fruit or use it as a topping for smoothie bowls. Makes 2.5-3 cups.